San Francisco rent is sky-high. San Francisco also receives gobs of the nation's share of venture capital dollars. Coincidence? Zumper, itself a venture-backed real estate website aimed at apartment seekers and renters, thinks not. 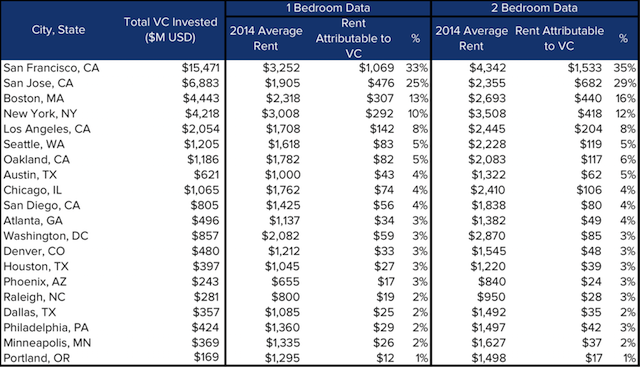 A report titled "Are Venture Capitalists Raising Your Rent?" [currently this page appears to be down] and authored by Zumper's Andrew Duboff argues that "33% of a 1-bedroom [price] in San Francisco can be attributed to economic stimulation from venture capital investment." It's just a simple result of VC money stimulating an economy, creating high-wage jobs, and increasing local housing demand. [For] every $1 billion in venture capital injected into a local economy, 1-bedroom rents will increase $69 per month, and 2-bedroom rents will increase $99 per month. 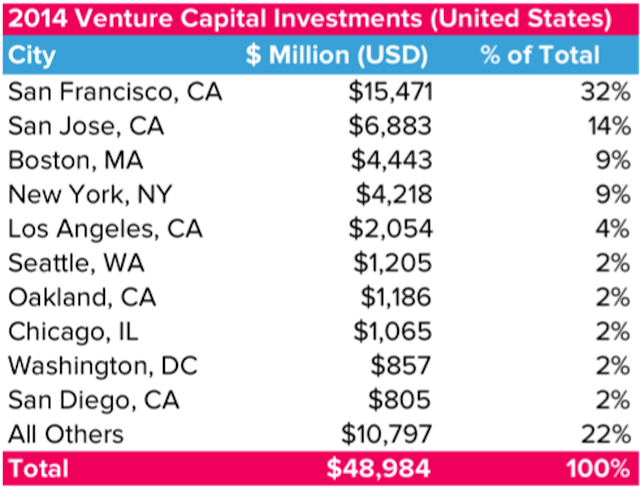 Although this may not seem significant, we must account for the massive scale of venture capital investment in major technology hubs of San Francisco, San Jose, Boston, and New York. In these metropolitan areas, the influx of capital has raised 1-bedroom rents significantly. At the highest level, $1,069 or 33% of a 1-bedroom in San Francisco can be attributed to economic stimulation from venture capital investment. San Jose takes second place, where 25% of rents can be attributed to investment ($476 monthly), followed by Boston 13% ($307 monthly), and New York, 10% ($292 monthly). According to Duboff, Zumper's analysts "completed multivariable linear regressions on average 1-bedroom and 2-bedroom rental data against venture capital investment dollars and macro-economic factors, including: US Census data (population, median household income, housing vacancy rates, unemployment rates), rent control ordinances, and median home values." The Business Times registered something less than shock at the news. "Housing costs have a strong correlation, if not the strongest, to job creation," they noted. "What's one of the first things entrepreneurs do when they get venture funding? Hire."